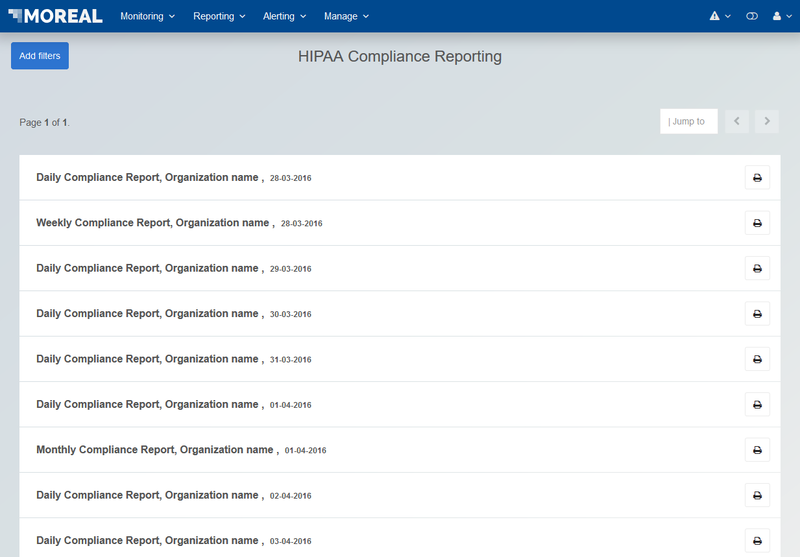 HIPAA (Health Insurance Portability and Accountability Act) compliant organizations can now print reports that respect selected compliance standards. The HIPAA Security Rule applies to all health plans, healthcare clearinghouses and to any healthcare provider who transmits protected health information (PHI) in electronic form, or electronic protected health information (ePHI). According to the U.S. Department of Health and Human Services, those that fall under this category are known and referred to as Covered Entities (CE). HIPAA requires that all the before-mentioned Covered Entities dealing with sensitive patient data must establish a security management process to protect patients’ confidential data from attempted unauthorized access, use, disclosure, or interference. MOREAL collects and analyzes log data across organization networks and creates daily, weekly and monthly reports, which are divided in 3 sections: System Activity, Data Access Reports and Security Incident Tracking. §164.308 Administrative safeguards(a)(1)(ii)(D): Information system activity review. (a)(5)(ii)(B): Protection from malicious software.